Released in July of 1971 and staying in production until the end of October, 1974, the Holden HQ is General Motors Holden’s best-selling vehicle of all time. Replacing the Holden HG, the HQ represented wholesale change, as everything about the vehicle was new. Customers could choose to have their HQ in a number of different body styles that included a four-door sedan, five-door wagon, two-door coupe, two-door ute, two-door cab-chassis or a two-door panel van. Power was derived from a range of motors that comprised a 173ci (2.8lt) or 202ci (3.3lt) inline six-cylinder or 253ci (4.1lt), 308ci (5.0lt) or 350ci (5.7lt) V8. The collective oomph from these powerplants was sent to the HQ’s rear wheels via either a three or four-speed manual or a three-speed automatic transmission. This particular HQ is a ’73 Statesman four-door sedan and comes equipped with the thumping 350ci bent-eight motor and three-speed automatic transmission. According to the seller, the HQ has travelled an original 242,000 kilometres from new and presents in original condition. 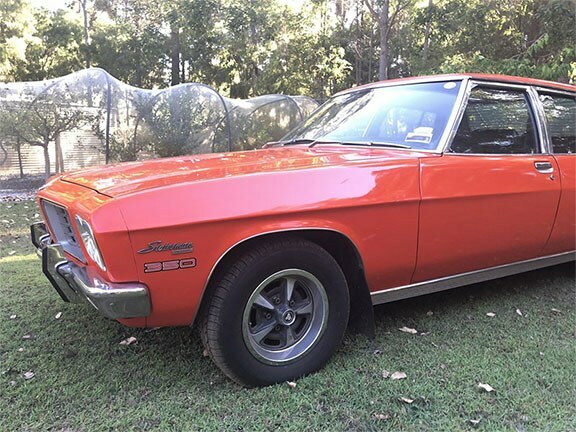 The HQ Statesman is $60,000 and anyone interested in this tangerine muscle car can view the full listing here.